Volume discounts are normally of little use unless customers are made aware of them. This extension provides an excellent solution to this need, allowing to display discounts directly on products when they apply. This extension allows to apply discounts to products in a customer’s cart based on the quantities that are purchased. The discounts can be shown directly on the products when they apply, a free-form description can be used for that purpose as well as an automated note. The discount information can be rendered automatically for applicable products in the shop, in product category displays, product sets based on tags, product archives and individual product pages. Options allow to choose where the information should be rendered automatically. 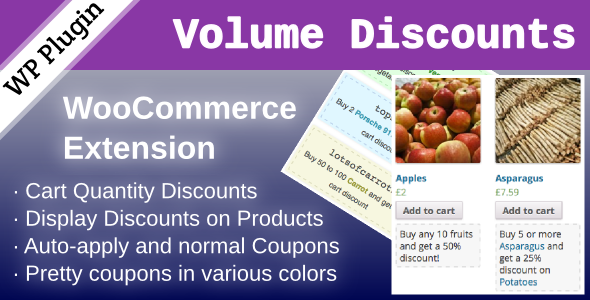 This extension adds a new Volume Discount section to coupons. Display options are provided that allow to show discount information where it is most needed, right where the products are. Inline styles allow quick customization for the theme. Coupons and discount information can also be rendered using a shortcode that provides built-in attractive styles out of the box. You can see this extension in action on the Demo site – limited shop manager access to the administrative back-end is enabled on the site, log in as user coupons using the password coupons to get access. You will be able to create coupons and see the new options that this extension provides for coupons. Two related extensions that provide additional options are also enabled on the site: WooCommerce Coupons Countdown and WooCommerce Group Coupons. Can this plugin also offer a free product if they buy at volume? Basically yes if you adjust the discount to the appropriate amount, for example, minimum quantity to 10 with a coupon that grants a fixed amount corresponding to one unit’s price. Is it possible to allow a coupon to be applied before the products in the cart meet the requirements outlined in the coupon settings? My client is hoping to offer discounts based on the number of products in the cart from certain brands. I.e. a 40% discount when there are 40 products in the cart. I had planned for the user to apply the coupon to their cart, and then be directed to the Shop and begin adding the 40 products. If their cart did not meet the requirements of the coupon I assumed they would be notified at checkout. P.s. apologies if this is more a question for the WooCommerce team. No problem, thanks for asking. As a coupon needs to meet certain conditions to be applied, the answer to your first question would be no. But wouldn’t the automatic application of a coupon be suitable for what your client wants to achieve? If you have a look at the extension’s documentation page, you will find details on its options to apply coupons automatically based on whether the coupons conditions are met. For coupons that are restricted to certain products or product categories, it also has options to show discount info like e.g. “Buy 3 or more in Arcade Games and get a 10% discount in Arcade Games” – you can see some of those on the demo – thus customers can be made aware of the applicable discounts based on the purchased quantity. Thanks for your reply. I may try and get in touch with the WooCommerce devs and see if they can help out. The automatic application may be backup a solution, but it will mean changing a lot of the pages on the site, and reworking the whole flow. We are using this plugin with URL Coupons, allowing the user to look through a list of payment solutions (coupons), then select the coupon they want and begin shopping with it in their cart. It wouldn’t hurt to ask them – I wonder if they have a way to apply the coupons even if they are conditional after the cart satisfies the condition to make the coupon valid. Can this plugin also offer a free product if they buy at volume? For instance… Buy 10, Get 2 free. Or Buy 5, Get 2 free? For example, you could configure one coupon to apply a discount for 5-9 units and another to apply a different discount for 10+ units. Is this plugin wpml ready? Do you have selected the ‘Coupons’ as post type translatable from WPML->Translation Options? If the problem persists, please give me what is the field that you want to translate. I was not creating the new coupons. I initially made the site and was just brought back to help. I have fixed the issue, the PlugIn needed to be updated, I did this and then created a new coupon that now works. How can I change the coupon text being displayed? Thanks Eamon, great to hear! There is a filter you can use woocommerce_volume_discount_coupons_info – it takes the current HTML produced as the first argument and the WC_Coupon as its second. You can implement a function to return the desired output as needed. I’d recommend to have a look at the get_volume_discount_info() method in the WooCommerce_Volume_Discount_Coupons_Shortcodes class for guidance. I have using the PlugIn on a site for a long time. I recently updated it. I have a Discount applied on a catagory called “Twinpacks”, Basically it should apply the discount of minus 20% on any purchase of 12. The coupons is working fine, but for one coupon, the default display is not working. It applies the discount, but wont display the freeform message (in the shop, on the product page or anywhere else). The Coupon/discount works fine on the other products, very unusual! Very strange, have you encountered this before? Ok this is working fine. The discounts are applied only to the eligible products. But as you have a category and let it count towards the sum of products from that category to apply the coupon, it will discount only the allowed products but will apply the coupon correctly as soon as the sum of products from that category in the cart is >= 3. You might want to create an additional category that contains only those products to which the coupon should be applied and use that one instead of the a more general category that contains also those products that should not be included with the coupon. That way, only those products that are to be discounted will count towards the sum used to validate the coupon. I have a client that wants to have coupons for packs of product. Example pack of 4 bottles. (these need to be coupons, not just automatically applied if there are 4 bottles in the cart). She would also like to be able to use the coupon more than once on the same order. Example: 2 instances of the “4 pack” coupon. 8 bottles total, just using the coupon code twice. Would this plugin be able to work? With the plugin you can set a minimum and a maximum of units, but you can not apply the same coupon code on an order ( Woocommerce does not allow it ). Although Antonio is right in that you can’t apply the same coupon twice, it’s not necessary to have that possibility. If I understand you correctly, you want to have the coupon applied to as many instances of the pack as the client orders. This is simply achieved by restricting the coupon to that specific product (you can use a Percentage Discount in WooCommerce 3.x or use a Product Percentage Discount in WooCommerce 2.x). You would have to select the product that the coupon should apply to only; when a client orders that product, the pack in your case, the coupon will be applied to the line item, effectively granting a corresponding discount on the number of packs purchased. You could also use a fixed amount limited to the product instead and it would be applied to each instance of the particular product ordered. Just a note on the pack itself, you can either create a simple product that represents the pack, or use product variations where the variations could be ‘1’, ‘4’, … and you could limit the discount to the specific variation that represents the pack of 4 bottles. The WooCommerce Volume Discount Coupons plugin would help you in limiting the discount to a certain quantity of that variation purchased, in this case, you probably wouldn’t even need it unless you only wanted to grant e.g. a discount on at least 3 packs purchased. Is it possible to set discount in % on a variable product, just one of all variations. Like this: If we have t-shirts with different colors in one product. And we got pants in diffrent colors in another product. I would like to give discount in procentage if customer buy maybe black tshirt and blue pants, but it must be 3 pcs. If customer buys red tshirt and red pants it’s no discount. 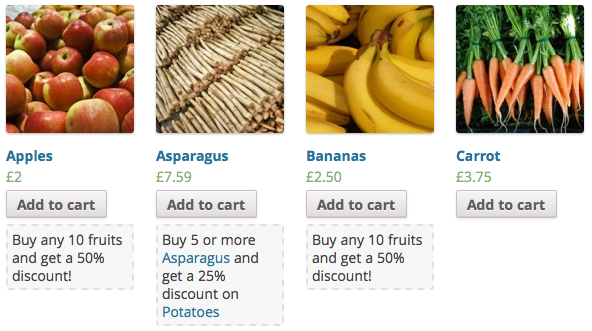 Hi there – Would be be able to automatically add deals to cart such as 12+1 free or 24+3 free with your plugin? exactly this option is not available, but you could calculate the discount based on your deals. Ex. if you want 9+1, you could create a coupon of 10% if you have 10 products in the cart. Please have a look at the documentation section. I am using the Gravity Forms Product addon with WooCommerce and I am curious if this plugin has been tested with the Gravity Forms Product addon to see if there are any issues. really I have not tested with this plugin, but there should be no problem. Hi, how does this plugin work with woo multi-currency plugin? the plugin limits the coupons based on the products quantity, not on the order amount, so this should be compatible with the Woo Multi-Currency plugin. I bought this plugin for a client and he functionality works well. However, the design output is not really visually pleasing. Is there any way to have more control over the verbiage that is output on the coupon? The name of the product is 13 x 13 White and makes for really clunky display from a text perspective. 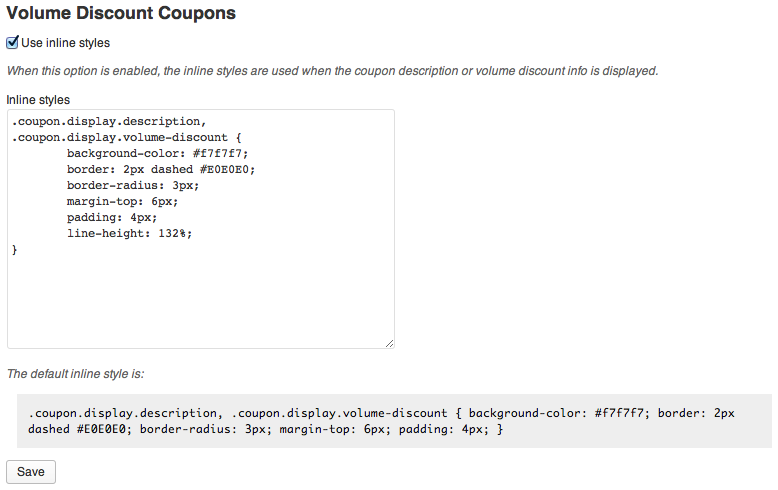 You can use the ‘use inline styles’ to customize the coupon according with your theme. If you give us an url, I can try to help you. We bought your ‘Discount Coupon’ Plugin and use it already for a while. Now, we couldn’t find any way, to display the products + coupons inside a slider at the homepage. The coupons which is the most important thing in this case is somehow never displayed. Is there a Plugin recommended or a different way for? Hi I just bought your plugin on Code Canyon. Everything is fine except for the fact the the plugin is giving the discount to other valid products that are in the cart but not meet the quantity requirements. I only want the discount applied to the product that meets the two requirements. Thanks for using the plugin! In this case, you also need to restrict the coupon to be applied to Product A. The discount type should be “Product % Discount” (in the General tab) and under Usage Restriction > Products choose Product A – this is so that only Product A is discounted. With this plugin you have the option to show what discount is applied, but it’s not exactly the same as in the screenshot. You should have a look at the documentation here for details. Clicking the image of a product and redirecting to an affiliate link is not a functionality provided by this plugin. WooCommerce allows you to define external products which provide a button that you can link using the affiliate URL. please give us your wordpress, woocommerce and Woocommerce VOlume Discount Coupons versions. I suggest you upgrade your php version. If you can not do it, you can send us dashboard admin access to support at itthinx dot com and we'll try to fix it in your environment. @Antonio I think we should fix this right away, although an upgrade would be a solution, it’s easier if we simply avoid the usage of empty that is incompatible with prior versions of PHP for now. @Lauren The fix will be released later on today, please update your installation as soon as you are notified of its availability. Many thanks for pointing out the issue and for using our plugins! Fixed in version 1.2.2 which will be made available shortly. It’s a client’s site hosted on GoDaddy so I will check out what I can do about the PHP version. In the mean time, I will look out for the update. Thank you again for the fast response and fix! I have deactivated and deleted the old plugin and installed the new version of Volume Discount Coupons that was updated in February. The old version quit calculating and the new version is not working either. This is for a mixed case of product in one category (Wines). Although the new version installed with the same settings as before, which was helpful, I still cannot get it to calculate a 15% discount. please share your settings and the product settings, so we can emulate your case in our demo site to test it. You have a usage limit set to 1 per coupon – this is a general setting for WooCommerce coupons which means that you allow the coupon to be used at most once, for anyone. Thus the discount isn’t applied. Hi Antonio, I am checking my email and spam box and no email, just copies of follow-ups from this site. Maybe yahoo mail is blocking your emails I don’t know. I posted this message now with my gmail, please try again. Don’t worry, sent it to gmail. I boght the plugin today, and installed it, but now I don’t see anywhere the functionalities of the plugin no. coupons nothing. The only thing that is available is in backend on left side under WooCommerce menu, there is a “Volume Discount Coupons” tab, when I click it the only thing I get is the Inline styles section, and nothing else. Where is everything else, where is Volume Discount section to coupons? Hi Antonio, I believe it is something so simple as that, But the problem is that I don’t have anywhere any option to create new coupon, nor I have the menu Woocommerce->Coupons editing/adding a coupon)! I don’t know why it isn’t there? As I mentioned there is only a tab “Volume Discount Coupons”, when I click it, the only thing I get is the Inline styles section, and nothing else!? 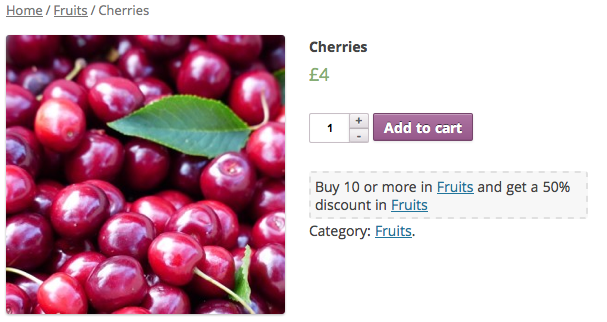 the menu is Woocommerce->Coupons. 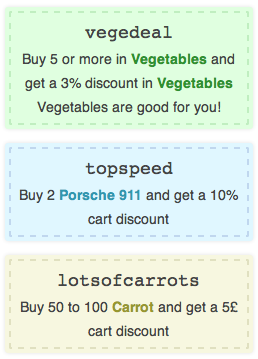 In this submenu you have a table with all the coupons. If you edit or add a coupon you have a section with new fields. there is no “Coupons” option. It seems like the plugin doesn’t work on my installation. What would be the solution for this? Probably you have a problem with your woocommerce version installed, because ‘Coupons’ submenu is added by Woocommerce as default. You can try to disable all plugins relating to coupons and woocommerce extensions (maybe a plugin is creating a conflict). If it doesn’t solve the problem, be sure you have installed the last version of woocommerce. Antonio, I tried everything I could think of. I disabled all plugins related to woocommerce. And tried even with default twenty fourteen theme. The version of woocommerce I use is tha latest one 2.3.13. But there is still no change. Is there anything I am missing here, what else can I do? Hi Marjan, answered by email. Hi Antonio, I appreciate your help, but I did not recieve your email, can you please send me again. Are you sure the plugin is working correct with WooCommerce 2.3.11 ? Please let me know is there is an update. Yes, what exact coupon settings are you using please? For now i deactivated the plugin because it is not working correctly. Thanks for the details, you have several categories which you have set under Usage Restriction > Product categories. This is to limit the coupon to those products in those categories which is ok. 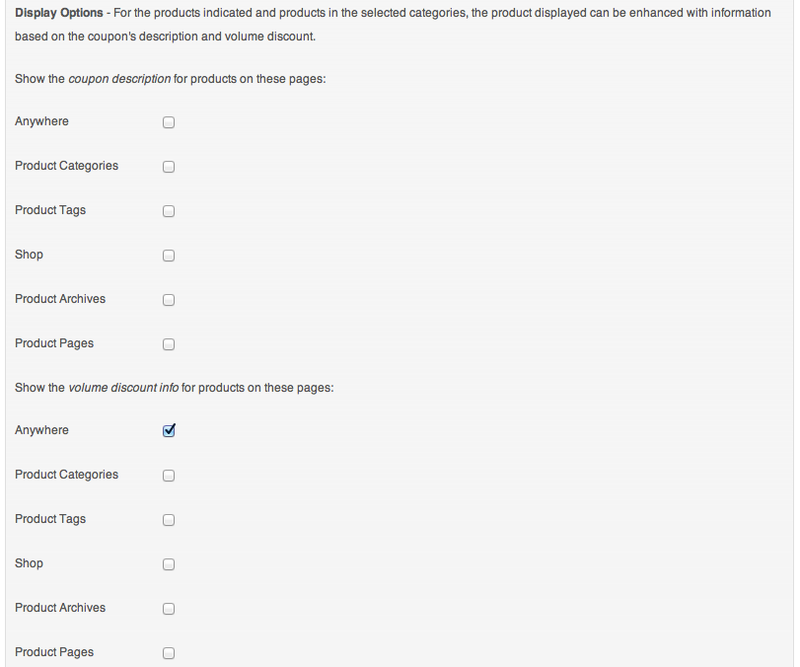 But have you also chosen the appropriate categories under Volume Discount > Product categories? After you have checked that and if you still don’t get the expected results, please forward admin access to support at itthinx dot com and indicate the coupon which doesn’t seem to produce your expected results and a link to this comment as well as a short explanation of how what you see is different from what you expect based on the settings used. We’ll have a look at the coupon settings and test it for you. Yes i have both. First i hade only Volume Discount > Product categories, but now i also added the samen categories under Usage Restriction > Product categories. Still the same result. In the cart i get plenty of messages ‘Couponcode succesvol toegepast.’ but nothing is applied in fact. I’m sorry but i can not give you admin access to the admin. I’m think my settings are oke. We need to be able to have a look at your settings and test it to help. You can provide access to a staging site which replicates your production site, this would be preferred anyway. What you indicate could be a plugin conflict and we would need to be able to deactivate other plugins to check what’s interfering. Once you have set up a staging site, please send admin access for that to support at itthinx dot com and make sure to include a link to this comment. Thanks, I was NOT putting the product on the Usage Restriction tab AND the Volume Discount tab – when I did, the product names appeared twice in the automatically generated Volume Discount Coupons which looked very strange as the product names were really long. The only thing lacking now in the Woocommerce Coupons is the ability to not allow a specific other coupon to be applied when setting up a new coupon. Thanks Peter, I’ll check what you mention about the duplicate product names. 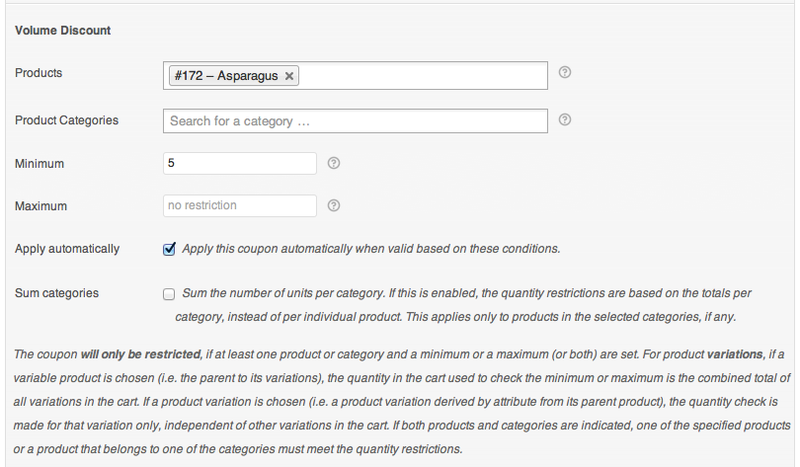 Regarding the exclusion of coupons, you might find WooCommerce Coupon Exclusions useful. All goes well when a customer orders the minimum number of Aub. Kitte but then every time they order a different plant, but of the same pot size they get that discount applied to it. (Even though the variation for that plant’s pot size is a different hash tag number). This sounds like you’re not restricting the coupon to a specific product or product category. See http://docs.itthinx.com/document/woocommerce-volume-discount-coupons/ please for details on the additional restrictions and http://docs.woothemes.com/document/coupon-management/ for the standard settings that you need to use for this. Gentlemen, I have never been able to update my Volume Discount Coupons for WooCommerce Version 1.1.1 to version 1.1.3. Each time I go to install new plug-in selecting (browse install zip) “codecanyon-5539403-woocommerce-volume-discount-coupons” I come up with an error message. I have perused your documentation but have not found anything specific for updating version 1.1.3. I would like to note that I have not uninstalled version 1.1.1 prior to attempting to install 1.1.3 as I have been afraid that I was lose all of my current discounts that are set up, some of which are specific to clients. Would you please advise how to correct this problem or point me to the documentation that gives a step-by-step procedure on how to upgrade. Lastly may I ask if you plan on an automatic update in the future? You must deactivate and delete the previous version before you install the new one. I would recommend to put your site in maintenance mode while you do that (recommended: http://wordpress.org/plugins/ultimate-maintenance-mode/). We don’t have immediate plans to support automatic updates for it, but I appreciate the suggestion. I hope that helps, please let us know if you need further help. Further to your response shown below, when deleting version 1.1.1 in order to update to 1.1.3, is it necessary to manually save the information on my existing discounts setup in 1.1.1 or is the data stored automatically and migrated into 1.1.3 once installed? There’s no migration involved nor do you need to manually save information, simply the plugin replacement and you should use the maintenance mode to avoid restricted discounts to be used while the plugin is not active. Just bought the pluggin. I’m having a problem. Trying to create a BOGO 50% OFF. However, when I add more product to the cart, its taking 50% off the whole cart, not allowing for 50% off the second product. I bought this pluggin simply for this purpose. You have to use a Product % Discount instead of a Cart % Discount. This is a standard setting for WooCommerce and I’d recommend you to review the section on Coupon Management to better understand how coupons are set up in general.